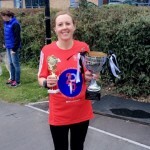 An awesome performance considering Jan completed the London Marathon last Sunday and the Pentrych hill race just two days ago. 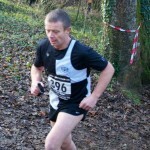 In 2nd place was Iestyn Henson 37.45, 3rd place Gwyn Lloyd 40.16, 4th Jamie Bishop 36.50, 5th Darren Bishop 29.32, 6th Carl Edwards 36.52, 7th Steve Hooper 34.03, 8th Mike Smith 41.09, 9th Brian Gough 41.48, 10th Gwen Richards 42.13, 11th Philip J Williams 32.23, 12t…h Samuel Jody Richards 30.44, 13th Phil Meyler 35.26, 14th Graham Bingham 44.00, 15th Paul Graham 30.56, 16th Nathan Jones 45.34, 17th Fiona Campbell Pounder 48.31, 18th William Denny 38.38, 19th Bridgette Griffiths 49.30, 20th Laurence Pole 35.40, 21st Sian Khalil, 22nd Caroline Best 48.32, 23rd Bretti Paxton 48.00, 24th Stephanie Jones 68.00, 25th Julia Herbert, 26th Brenda Evans, Also running was Peter Howell 41.47 and Rachael Jordan 49.18. 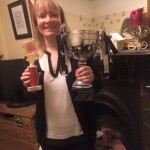 Jan Edwards April Handicap Race winner. 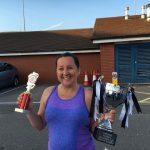 Congratulations to Stephanie Jones on winning this months handicap race in 55.48 a PB by 7 mins. In 2nd place was Julia Herbert 58.55, 3rd with a PB was Kristie Marie O’Connell 34.22, 4th Gwyn Lloyd 40.20, 5th Adam Edwards 31.46, 6th Russell Bown 38.39 PB, 7th Carl Edwards 36.58, 8th Iestyn Henson 38.50, 9th Fiona Campbell Pounder 46.28 PB, 10th Darren Bishop 29.30, 11th Philip J Williams 32.08 PB, 12th Billy Hayton 30.00, 13th Nick Pounder 37.30, 14th Paul Graham 30.08, 15th Ruth Caddy 57.36, 16th Jamie Bishop 38.33, 17th Mike Smith 42.28, 18th Sian Khalil 42.42, 19th Graham Bingham 43.40, 20th Neil Fitzgerald, 21st Steve Hooper 35.13, 22nd Peter Coles 31.22, 23rd Nathan Jones 24th William Denny 38.18, 25th Caroline Best 44.45, 26th Laurence Pole 35.15, 27th Clara Evans, 28th Samuel Jody Richards. Congratulations to Russell Bown on winning this months Race in a time of 40.40 in 2nd place was Rebecca Louise 41.40, 3rd Phil Meyler 35.20, 4th Caroline Best 43.24, 5th Mike Smith 41.29, 6th Steve Hooper 33.58, 7th Nick Pounder 36.38, 8th Laurence Pole 31.48, 9th Darren Bishop 29.40, 10th Griffiths Warners 39.54, 11th Billy Hayton 29.37, 12th Bethan Ford 43.55, 13th Graham Bingham 43.55, 14th Mike Gwynne 37.37, 15th Fiona Campbell Pounder 49.30, 16th Liz May 38.15, 17th Iestyn Henson 40.36, 18th Rhian Durham 43.30, 19th 43.30, 20th Clara Evans 32.24, 21st Stephanie Jones 62.25, 22nd Paul Graham 30.01, 23rd Peter Coles 30.55, 24th Charlie Smith 44.04, 25th Hywel Morgan, 26th Kerry Jones 69.00, 27th Sarah Boothby 82.00. Abby Foster 39.23, Rebecca Louise 45.23, Stephen May 36.00, Nathan Jones 48.14, Phil Williams 33.00. Also running was Bethan Ford 45.36, Stephanie Jones 64.00, Brian Gough 45.36, Lisa Williams, Ruth Cochran, Kathryn Bates, Simon Pritchard, Jan Edwards, Neil Brooke Smith, Jake Brooke Smith.